Mary Parke Thompson and her husband David Thompson served as missionaries to Japan for over five decades. In this second excerpt from Mary’s diaries, she records her first overseas voyage to Japan and her first several weeks in the country she would come to call home, including some of her first encounters with her future husband. Mary Parke left San Francisco April 1, 1873, aboard a paddle-wheel steamer bound for Yokohama. She was sick most of the way. April 13: A long period of neglect, my diary.... Weary days have intervened, days of sickness and discouragement. I have felt so well today, and this is the first time I could say as much. I am so glad and thankful. April 24: The [ship’s] captain came to my door this afternoon and talked a long while. He also came into the saloon this evening and we have talked till eleven o’clock. I am pleased with him. He does not believe in crushing the man-hood in any one, be that one an inferior—a Chinese—or no. It is so gratifying to find the chief officer to be of such a spirit. Original lithograph ca. 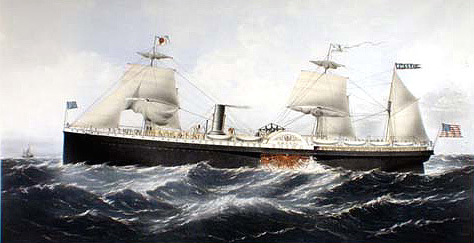 1867 of the wooden side-paddle-wheel steamer "China," built for Pacific Mail's pioneering trans-Pacific route between San Francisco and Yokohama. Via FoundSF . April 25: I have been up on the top of the steamer with the first engineer and looked down on the wheel. Fifty-four revolutions in a smooth sea make a mile. With the stewardess and second steward, and several others, I have been around through the steerage, cook rooms, pantries, etc. Neat and clean and airy, but the Chinese are packed together. The steamer arrived in Yokohama April 27, 1873. April 28: I must revert again to yesterday. Our sail up the broad smooth bay of Yedo [now Tokyo] was delightful…. Mr. Loomis [Presbyterian missionary Rev. Henry Loomis] came on board soon after the steamer anchored…. In company with Mr. & Mrs. Gulick we were rowed to shore by two Japanese in their little boat. At the custom house my trunks were inspected by the authorities merely opening the lids and looking in. Then they were put on a two wheeled cart drawn and pushed along by four coolies who kept time by the utterance of a peculiar cry. —A pleasant home and kindly reception by Mr. Loomis. In the evening Mr. Loomis, Dr. Bliss and I went to a prayer meeting at Mrs. Pruyn’s. An interesting looking company of Japanese were singing hymns in English when we went. Their voices did not tell that they were heathen. I would have thought with my eyes closed that it was a home company. April 29: The rest of the forenoon studied Japanese and listened to the instructions of the Japanese teacher. After dinner, came up to my room and studied a long time…. April 30: I am to go to Yedo [now Tokyo] to see Mr. Carrothers' family this afternoon [Presbyterian missionaries Rev. Christopher and Julia Carrothers]. I am much impressed with the pure, fervent piety of Mr. & Mrs. Loomis and am greatly disposed to remain here [in Yokohama] and study until the other ladies come. 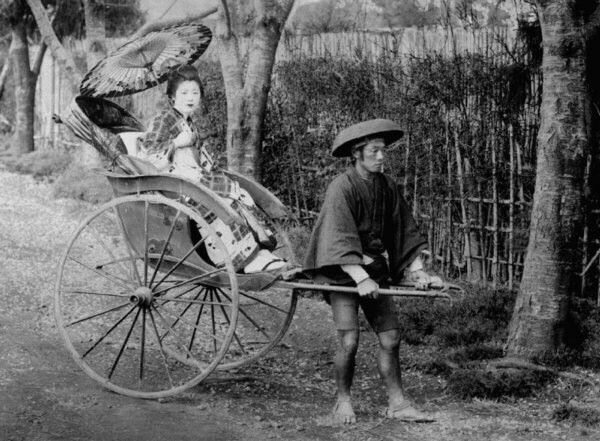 Nineteenth century Japanese rickshaw, n.d. Via Arts-Wallpapers . Yedo, May 1: In the afternoon I rode to the depot in a “Ginricisha” [rickshaw]. …met on this side by Mrs. C. and conveyed to her home by the same means as that which brought me to the depot on the other side. I cannot feel at ease drawn by these poor men who trot along like a horse. It seems like degrading them, and yet it is only favoring them by giving them employment. May 2: Mrs. Carrothers and I rode all round the castle of the Micado, and also called upon some of the friends in government employ, Dr. McCarty, Mrs. Verbeck, etc. Mary Parke returned to Yokohama but was then assigned to live with Rev. and Mrs. Carrothers in Tokyo. Single woman were typically housed with couples or with several other women, both for security and because new missionaries need the interpreting and trouble-shooting skills of more experienced people. Yedo, May 8: Since I have been gone Mrs. Carrothers has made various improvements on my room…. I will at once begin to study and pray for the willing heavenly Helper to be with me. Evening—have been studying Japanese, helping Mrs. C. in her school, walking and talking with her an[d] a former teacher of hers…. How can the heathen know why we leave our happy native and to come and teach them!... I gain many useful items from Mr. Thompson [Presbyterian missionary Rev. David Thompson, whom Mary would wed in May 1874]. May 10: The day has been spent in making a visit to one of Mrs. Carrothers pupils’ home—Kobayashii. To me it was one series of pleasures and surprises. Such unaffected kindness and politeness is seldom met in our home people, and these are called heathen…. We would be led to forget, for the time, that these people have never drunk at the fount of true happiness. What a trial it was not to be able to speak to them! A talk with Mr. Thompson. I like his Christian spirit. Sab[bath] [May 11]: A little rainy. Attended service at the Union Church at eleven o’clock. Mr. Thompson preached from Rom. 8.32(?) “He that spared not his own Son” etc. While his modesty is to be admired, for his own sake we wish he had more confidence in himself. Only eight foreigners present of the two hundred who are in Yedo. Verily, the force is not strong in members who would take Japan for Jesus, but O we pray, we trust that they may take it. In the after noon Mr. Yegashra and his friend called. We read in the Bible and talked long together. I am to begin teaching him and others if they come one week from tomorrow. Mr. Thompson took dinner with us, and we have spent a pleasant evening singing with [one of his classes]. The Presbyterian Historical Society received the Thompson Papers in 2011, a collection that includes Mary Parke Thompson’s seven handwritten diaries. PHS volunteer Sue Althouse, herself a retired missionary to Japan, has been processing the Thompson Papers, and she has chosen excerpts from Mary’s diaries to share with readers. To read the first excerpt, visit: http://www.history.pcusa.org/blog/2014/06/missionary-calling-will-god-so-honor-me . Probably Congregational missionaries Rev. O.H. and Ann E. Gulick.